Better Balance for Your C and T with Taiji? As they age, many men notice changes in physical, cognitive and sexual function. Some researchers have suggested that such changes may be driven, in part, by changes in endocrine function, such as hormonal shifts in cortisol and testosterone (CT) levels. A decrease in testosterone is common in most aging males, as is an increase in cortisol, sometimes called the stress hormone. Extreme changes in either of these important endocrine markers is associated with a wide range of physical and mental health issues, including sexual dysfunction, depression and lower self-reported life satisfaction. Researchers in Germany and Switzerland, taking note of the wide range of mental and physical health benefits of taiji and qigong, launched an exploratory study on men's health to see how long-term and regular practitioners of taiji and qigong compare to age-matched controls. The researchers (Walther, Lacker & Ehlert 2017) from the University of Zurich and Dresden Technical University, published their findings in the journal, Complementary Therapies in Medicine. Below is a summary of their study. The authors focused their attention on participants in a regional Swiss-German taiji association, Suny Kamay Energy and Martial Arts Academy (SKEMA). 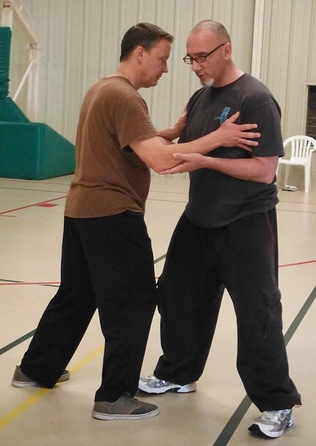 They recruited 56 healthy men (40-75 years), practicing a mix of taiji, qigong and self-defense gongfu skills at SKEMA, and compared them to 55 age-matched healthy male controls from the Men's Health 40+ Study. The taiji-qigong-gongfu (TQG) practitioners were polled on their number of years of practice and average number of weekly practices. They also provided salivary cortisol and testosterone samples and were given surveys on mental health, life satisfaction and sexual function. The measurements of cortisol and testosterone were transformed into CT-ratio scores, something the authors refer to as an integrated endocrine parameter. Among the TQG practitioners, those with the most years of experience tended to have fewer depressive symptoms and higher satisfaction with life. Frequency of practice was also positively associated with these benefits, as well as trends toward better sexual function and endocrine function. When compared with controls the TQG group showed a trend toward less depressive symptoms and higher life satisfaction, but only the TQG practitioners with four or more practices a week scored significantly better on measures of endocrine function. The authors conclude that these findings may be evidence that regular TQG practice can decelerate the effects of aging on the endocrine system, but admit that the current study would need be replicated with a larger sample, following the men over time, to strengthen support for these findings. Anecdotally, I am interested in hearing what your experience has been. How much practice is enough for you? How much practice is too little? Catch me at camp this summer and let me know if you have noticed a difference in how you feel based on the frequency of your practice.